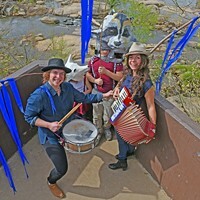 Last Gasp: What Richmond's Future Holds in the Final Days of a Lame-Duck Mayor | Cover Story | Style Weekly - Richmond, VA local news, arts, and events. With his term coming to a close, Mayor Dwight C. Jones delivers his seventh and final State of the City address Jan. 28. He spoke mainly of economic development successes and charted a course for what remained. 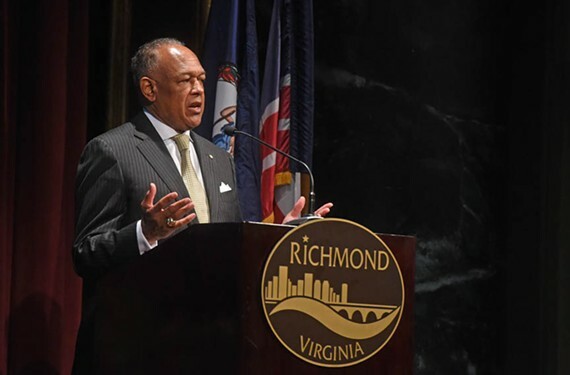 As Mayor Dwight C. Jones enters the final months of his second term in office, the good, the bad and the ugly of his legacy as Richmond’s second popularly elected mayor in more than 50 years are being picked apart. Jones has moved the city forward with commendable and measurable successes. But his administration isn’t a stranger to dismal failures, either. In his seventh and last State of the City address, the mayor spoke extensively of his strides in economic development. Afterward, the advice he said he would offer a successor centered on urban growth and the young. As testament to this emphasis, the Broad Street Arts & Cultural District lives and breathes outside of one night a month on First Fridays. And the future of the city’s impoverished East End looks brighter with the anticipation of jobs to be created by Stone Brewing. The piney smell of the California brewery wafted in the air of the Fulton Hill facility in the fall, when Jones toasted the construction progress with Gov. Terry McAuliffe and company officials. At the Executive Mansion with Gov. 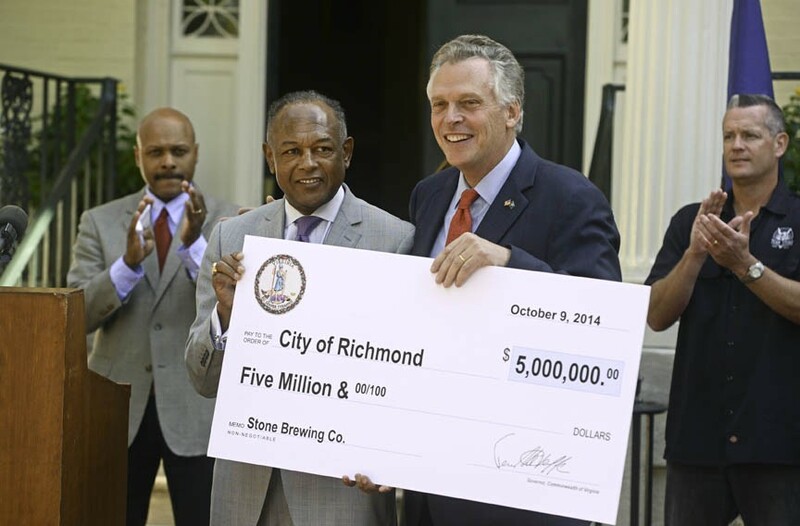 Terry McAuliffe, Jones receives a check for $5 million in state incentives for Stone Brewing Co. in October 2014. The brewery, which officially opens March 2, was widely celebrated as an economic-development booster and job creator. The city also has invested in major renovations at the Port of Richmond to increase its relevancy as a regional economic development asset. And there was a thrill in watching bright jerseys streamed to blurs while bike riders sped along city streets during the UCI Road World Championships in September. While the immediate economic return of the races is questionable, supporters emphasized the event as a way to raise Richmond’s world profile and pedal a top-tier event through to the finish line. But darker times and issues such as financial ineptitude have dogged the administration. A financial report due to the state in 2014 was submitted a year late, and the city is still playing catch up. Jones also has been accused of not putting schools high enough on his priority list, amid looming infrastructure needs that have left buildings crumbling. And despite Jones’ determination to not be defined by news stories and headlines, as he proclaimed in his yearly address, he’s received plenty of media attention about how one of his high-ranking officials spends time on the city’s dime. A report from city auditor Umesh Dalal found that Public Works Director Emmanuel Adediran spent 38 hours of work time overseeing the construction of the Chesterfield location of First Baptist Church of South Richmond. Jones is its senior pastor. A full inquiry is still underway. A lot of ground has been covered during Jones’ time in office, with lessons emerging for the next administration about what works and doesn’t in crafting Richmond’s future — and staying out of trouble. But what’s left for the mayor to accomplish, and what could he get done in his final months in office? What will he hand to his successor? 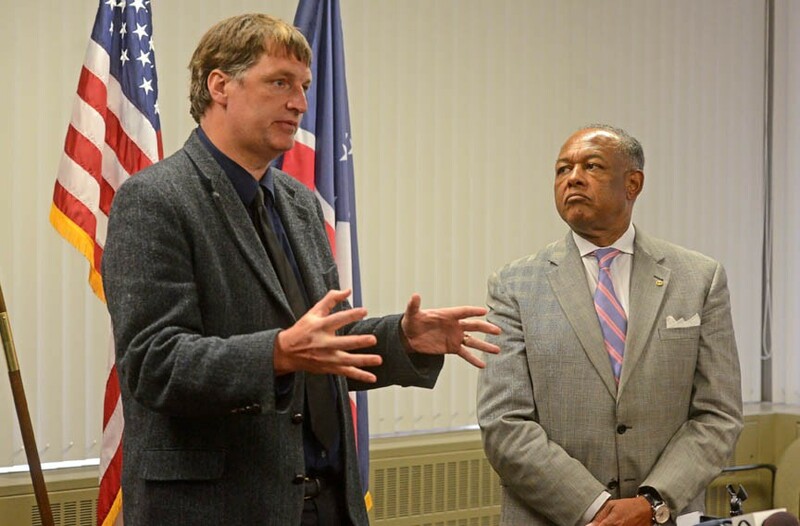 Thad Williamson, head of the mayor’s Office on Community Wealth Building, speaks during the announcement of his appointment in April 2014. 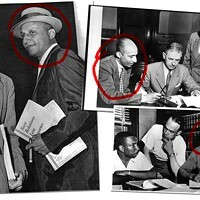 On leave as a University of Richmond professor, he was charged with getting the office up to speed to tackle poverty. The continuation of the city’s initiatives to alleviate poverty is a good place to start for where a future mayor could roll up his or her sleeves and get to work. The office was established a year and a half after a recommendation from Jones’ Anti-Poverty Commission. The task force released a report in 2013 detailing five general solutions to poverty. An established place in City Hall has made tackling poverty an official priority, but you won’t see any major percentage-point drops in the poverty rate in the near future. Economic inequality issues spanning generations will take decades to solve, says John Moeser, a member of the commission’s transportation committee and senior fellow for the University of Richmond’s Bonner Center for Civic Engagement. Will there be public patience? The next mayor may be expected to deliver tangible results from the office’s efforts over a four-year term and certainly if re-elected to a second term. The office received $2.6 million for this fiscal year, which includes the $97,920 salary of Thad Williamson — the Harvard University-trained professor from UR hired to oversee program implementation. A jobs center was established in an attempt to lower unemployment. It generated 176 hires as of October. Other efforts focus on education, such as RVA Future, which aims to provide guidance on options after graduation and eventually would provide stipends or tuition for college. Its funding comes from $425,000 in city money and $160,000 from other sources. There also are long-term plans that span other city agencies, such as the overhaul of Richmond’s antiquated public housing communities, some of which date to the 1940s. The goal is to replace outdated units with mixed-income housing. A major undertaking is Creighton Court, with 300 housing units planned at the 2-acre site. To make big gains in poverty alleviation, Moeser says, a key place for the next mayor’s focus should be the expansion of mass transit. A regional plan to link parts of the city and to connect Richmond to surrounding jurisdictions was a key part of the commission’s recommendations. That effort is off to a monumental start, he says, with construction scheduled to begin on a rapid-transit bus line as early as this spring. 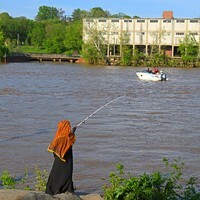 It will link Willow Lawn with Rocketts Landing along Broad Street, with buses running in a dedicated lane every 10 minutes during peak hours and every 15 minutes any other time. That level of quick connectivity is seen as making a world of difference to people who depend solely on public transportation. But while the line is a groundbreaking, Moeser says, there are no proposed rapid-transit routes to link communities along the Jefferson Davis Highway or Hull Street — which have some of the city’s densest concentrations of poverty — to the main route proposed along Broad. That could change. Late last year, the city secured state funding to review its bus routes to potentially reorganize them for better service. This could mean better connections from regular routes to the rapid line. Advocates hope that would expand rapid transit. Roughly 150 infuriated students, parents and teachers gather at City Hall in February to call for teacher raises and increased funding to fix deteriorating buildings. The rally came as the school system continues to hash out a budget with the city for the next fiscal year. While approximately 26 percent of adults live in poverty in Richmond, the figure is even greater for children, at 40 percent. And many of them attend outdated and dilapidated schools. To address the problem, the School Board has called for substantial budget increases to pay for facilities. 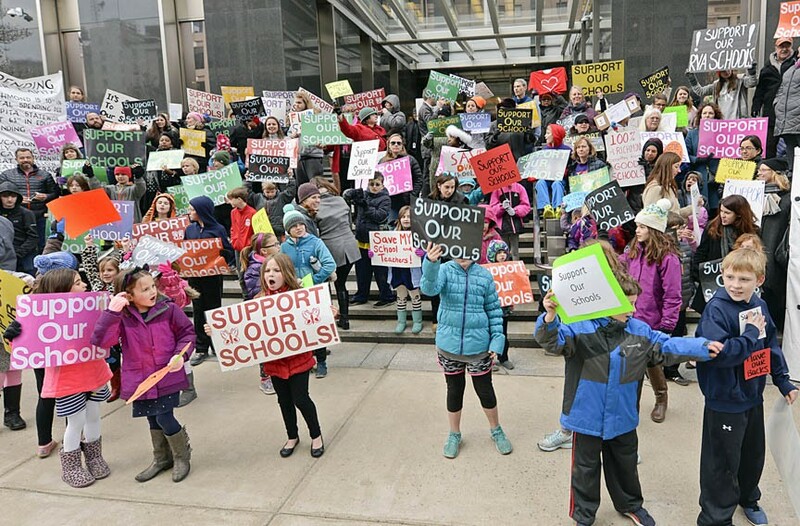 It’s a move that has widespread community support, including the roughly 150 teachers, parents and students who braved cold February temperatures to rally for the budget request on the steps of City Hall. Gloved hands clasped signs that read “Save Our Schools,” and drivers on Broad Street honked their horns in encouragement. Matt Ference, a Martin Luther King Jr. Middle School teacher, held a red sign with a bus sketched by a seventh-grader. He said change was needed to fix buildings. The School Board has insisted on the start of a $169 million first phase of a 15-year plan to overhaul the division’s facilities. The board sees facilities needs as so dire that, last week, it voted to request $105 million more for capital improvements after an initial request of $41 million for 2017. The additional money would be used to build and expand schools in the city’s growing South Side. The district typically receives $4 million annually in capital funds, but if the amended request is granted, it would give the division $196 million in capital project money over the next five years. On top of that, the school division’s proposed $293 million operating budget is $18 million more than last year, to pay for things like teacher raises and academic measures. The mounting infrastructure needs aren’t going to be solved in the months that Jones has in office. But his recent call for an Election Day referendum to determine where the community stands on raising taxes to fund schools has escalated community discussion about needs. And that seems to have been part of the goal. “Richmonders need to have a serious conversation about the resources that we have and the tax levels we can stomach,” he said during his January address. But a question posed by a lame-duck administration, which turns to a November referendum, thrusts the issue in the lap of the next mayor. Shortly after Jones proposed the referendum, Richmond Public Schools Superintendent Dana Bedden cautioned that it should be very specific about which measures such a tax increase are intended to support. But he didn’t have a lot of time to form an opinion, because the mayor hadn’t notified him about his proposal. That’s one of many examples of where communication has faltered between Jones and the School Board and City Council, despite the mayor’s call for the public to “broaden the conversation” on school needs. 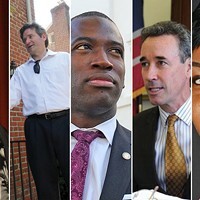 The next mayor will be left with governmental bodies with fractured ties. Only twice in 11 years has the School Board and City Council gathered to discuss budget needs — most recently in October. Council members said the mayor was invited. His absence was noted. Council members and schools officials seem to agree that the rift needs to be healed. Mosby said that the talks should be expanded to include conversations with the business community and state officials. Squirrels fans pack The Diamond during a sunny game day. The team’s future on the Boulevard is in question, with its lease ending in 2017 and Jones pushing a development plan for the area that may not include baseball. Even if school and city officials can band together under a new mayor, they will have to contend with the long history of financial mismanagement and revolving doors of City Hall. For months the city has operated without a clear financial picture, which has had consequences. Jones’ financial administrators submitted a report due to the state in 2014 a year late. They’re still behind, with a promise to submit a document to the state required by Nov. 30, 2015, by the end of this month — three months behind schedule. The amended submission date comes before the mayor typically unveils his biennial budget in March. Some council members said that late financial reporting got in the way of providing city services when council voted to shift $9 million from vacant positions to schools in this year’s budget. They said that the action was taken without a clear idea of the strains on financing basic city services such as trash collection, which plagued the city on the eve of the UCI bike races. Bulk trash continues to be an eyesore as pickup requests pile up. City Councilman Parker Agelasto also notes that a city ordinance will require the Finance Department to start providing monthly reports to council by April or May. Officials in the city’s finance office have blamed the faulty installation of a new database. The delays were central to accusations of mismanagement within the Finance Department, which has seen a large turnover of officials in recent years. But a leader isn’t only judged on the wise use of assets and resources. Visible changes also are taken into account. And Richmond is still waiting to learn what future will be determined for two of the city’s largest capital investments — The Diamond and the Bon Secours Redskins Training Center. Jones is moving ahead with plans to study the 60-acre site of The Diamond on North Boulevard, with the goal of soliciting developer proposals to change the face of the area and spur economic development. 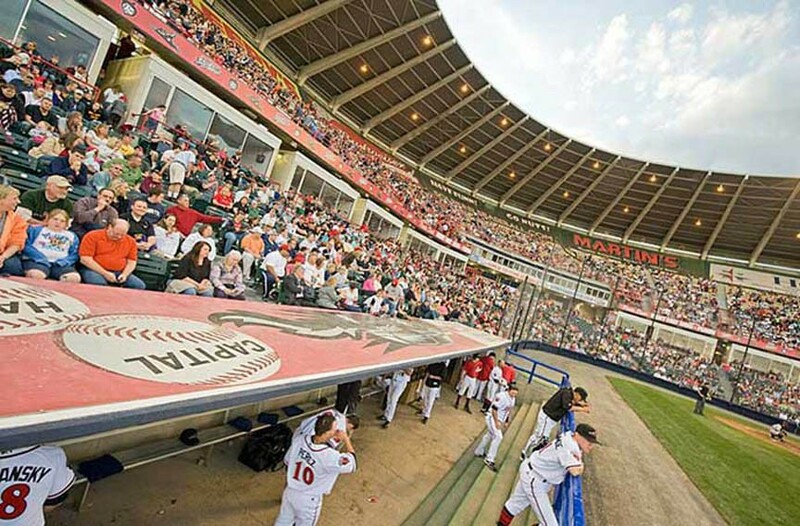 Baseball fans and others are worried that the Flying Squirrels will have to find a new home, because Jones’ proposal is silent on the future of baseball in the area. City officials have said that highest and best use of the property would be a prime consideration and that may or may not include baseball on the Boulevard. Crowds of mostly baseball supporters have criticized Jones during a series of public meetings the city has held to gather feedback on the plan. Even the governor thrust himself into the fray, with an invitation for Squirrels and city officials to talk things out with him at the Executive Mansion. 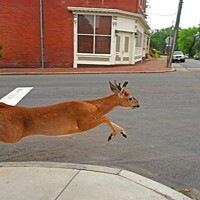 But even if baseball is factored into development plans for the Boulevard, the Squirrels may leave town if a new ballpark isn’t built to replace The Diamond, which is 30 years old. By May, the mayor aims to solicit proposals from development companies, which would leave the next administration to deal with how much revenue can be generated from the parcel. 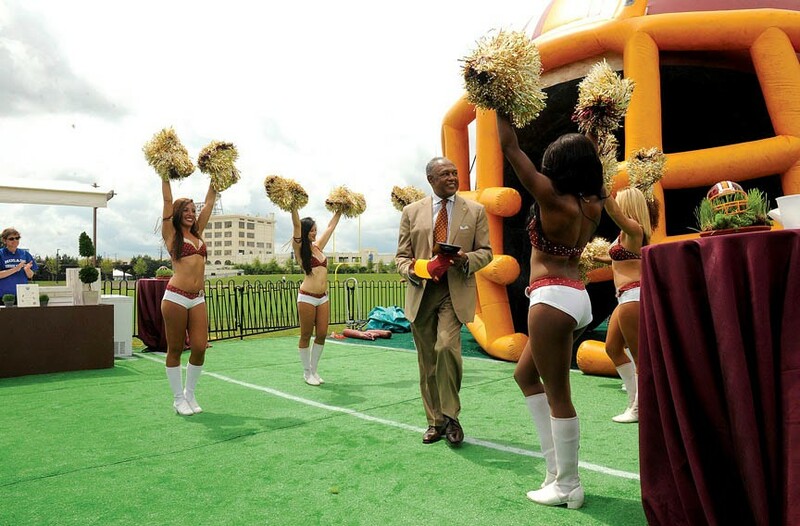 Jones makes an entrance on the field of the Bon Secours Washington Redskins Training Camp during its grand opening in July 2013. The city sunk $11 million into the facility, taking a risk for the promise of a heightened profile and increased development. While Jones’ administration is working to craft a financially successful future for the Boulevard, the Redskins training camp is failing to make the gains that many residents expected. The team is expected to bring an estimated $40 million in investment to the city, mostly through the expansion of Richmond Community Hospital. Its operator, Bon Secours — whose name is on the sports facility with a $6.4 million sponsorship — has an agreement with the city on a 60-year lease for a city-owned school, the future site of its nursing program. But the city isn’t seeing much of a return for the $11 million it invested in building the training camp, for which city officials moved funds from schools and the construction of the Richmond City Justice Center. The city has been unable to pay the entire $500,000 it owes to the team annually by contract. And average attendance has declined from 10,348 in 2013 to 6,222 last year. When questioned by the Times-Dispatch about the economic return of the training center on its opening day in 2015, Jones said that he expected the city to “eventually” be able to cover the city’s annual contribution. More than a year later, the statement is in line with advice he offers to a potential successor: Attracting millennials is key to economic development. And while Jones has started to tackle endemic poverty and made bold economic-development initiatives a top priority, the next mayor will be left with the basics largely uncovered. Schools will still be faced with systemic issues, City Hall is a financial mess and questions are being asked about whether the city is getting enough in return for laying a lot on the line for economic investments.